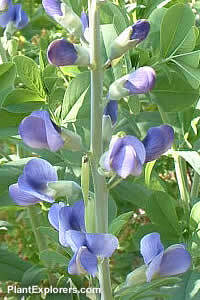 Erect perennial in the family Leguminosae with palmate green leaves that bears dark blue flowers in early summer, followed by black seed pods. Great for flower arrangements. Height 5 feet; spread 2 feet. For maximum freshness, please keep seed refrigerated in its original packaging until it is time to plant. Sow seed in containers in a cold frame as soon as ripe. Grow in open, porous, sandy soil in full sun. Deadhead after flowering.